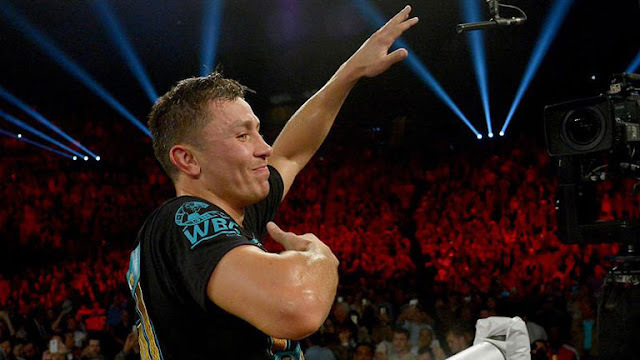 GENNADY GOLOVKIN has become the WBC middleweight champion of the world. It means he has unified three of the four major titles in the division, adding the WBC belt to the IBF and WBA titles he already holds, doing it all without having to throw an additional punch. The WBC had mandated that Golovkin must be Saul Alvarez’s next opponent for their world title. Once Alvarez vacated the title on Thursday, Golovkin, who held an Interim strap from the WBC, has been elevated to full champion. “The WBC has received official confirmation from Golden Boy Promotions with Saul ‘Canelo’ Alvarez’s decision to vacate the WBC middleweight championship. Gennady Golovkin is hereby recognised as the undisputed WBC middleweight champion of the world. The WBC wishes Canelo Alvarez great success in his career and will certainly look forward to see Golovkin vs Alvarez materialise in the future,” the WBC said in a statement. Immediately after Canelo had knocked out Amir Khan earlier this month, with Golovkin looking on, it seemed as though the two were on a collision course. Golovkin-Canelo would be one of the biggest fights that can be made in the sport. It does mean that Golovkin is waiting for a big name opponent. His last fight was a two-round demolition of Dominic Wade in April. These developments however make it unlikely that Golovkin-Alvarez could happen in 2016. The final world belt outside of Golovkin’s clutches is the WBO title held by England’s Billy Joe Saunders. A unification for all the belts would be a hugely appealing showdown.